Ideal for gymnasts and footballers. A high quality neoprene wrist support that covers the palm of the hand. Provides excellent compression, support and warmth. 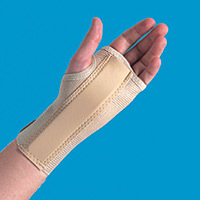 Ideal for the swollen, painful wrist that may persist after a broken wrist has healed. By retaining heat there is an increase in the elasticity of the soft tissues. 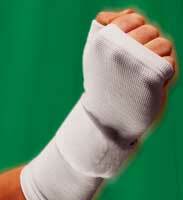 This is helpful for the treatment and prevention of wrist injuries. By increasing local blood flow, healing and recovery times can be reduced following a wrist injury. The Vulkan Long Wrist Support applies uniform compression from the palm to the mid forearm, making it ideal for the swollen, painful wrist. The Vulkan Neoprene Wrist Support is ideal for people who have suffered a wrist injury, such as a wrist sprain, where a uniform compression support can help to relieve wrist swelling. The Vulkan Neoprene Wrist Support can also help following a broken wrist (such as a Colles Fracture or a Scaphoid Fracture) and to relieve the symptoms of arthritis of the wrist. The high quality neoprene provides support, compression and heat retention which can provide relief for the arthritic wrist, particularly in cold weather. 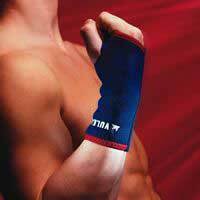 The Vulkan Elasticated Wrist Support provides effective support for the prevention of injuries to the wrist. Covers the wrist and the palm and is universal in design. Features an additional strap for weaker wrists. Designed to limit movement for those with repetitive strain injury (RSI). Features a removable aluminium splint. Not recommended for use during heavy manual work or sporting activities. Natural inconspicuous colour.